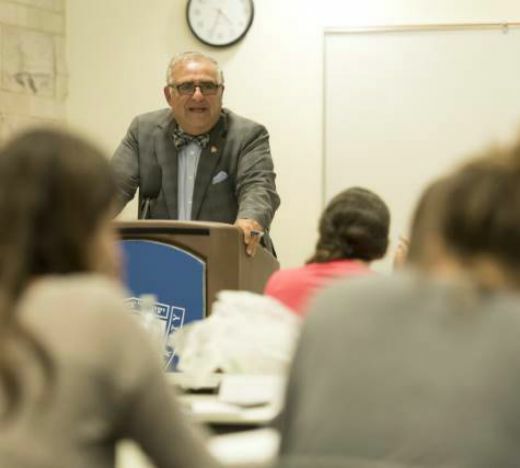 Each semester, Yeshiva University undergraduates are offered a rare opportunity to study the many complex challenges and responsibilities of nonprofit leadership with someone who juggles them on a daily basis: their own University president. President Richard M. Joel brings his life experience to the classroom for Leadership in the Non Profit World, a weekly course that explores the nuances of everything from professional or board relations to team-building, vision and charisma. But his experience isn’t the only one he shares with students: frequent high-profile guest speakers from a wide range of nonprofit organizations stop by to share their journeys with students, creating a rich tapestry of perspectives and priceless first-hand insights into some of the most critical and difficult issues facing nonprofit leaders today. Those speakers run the gamut from Rabbi Lord Jonathan Sacks, the Kressel and Ephrat Family University Professor of Jewish Thought at YU, who spoke to the class about Judaism and leadership this week, to New York University President John Sexton and Abraham Foxman, national director emeritus of the Anti-Defamation League. The course also draws on lessons from some of President Joel’s favorite leaders: United States President Abraham Lincoln and fictional President Jed Bartlett, whose White House tenure was painstakingly analyzed in The West Wing. President Joel’s goal for the course is simple: to craft the personal leadership skills and strengths within each student, ultimately positioning them to tackle the challenges of nonprofit leadership head-on. “For my part, the best thing about giving the class is that I get to spend ongoing time with a group of extraordinary students that remind me daily how exquisite this undertaking is,” said President Joel.